There may have been a plan to dump Biden, Edward Snowden gets a new job and you will never believe what a Texas cop did after she was shot. Obama/Clinton 2012: Well this may make for some awkward conversations in the Oval Office. 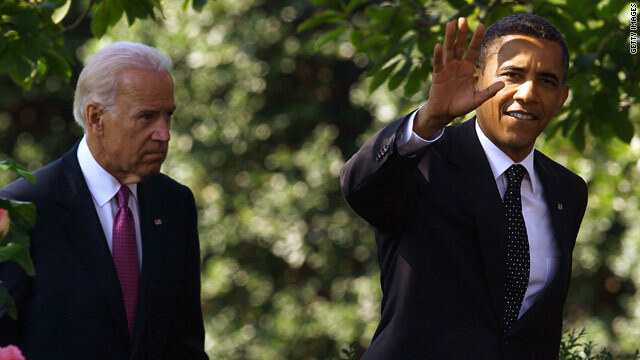 The New York Times reports that President Obama’s inner circle contemplated dropping Joe Biden to help him get reelected in 2012. Not only did they think about it, they picked Hillary Clinton to replace him, the report says. The bombshell is in a new book to be released. The plan was dashed when polling showed that replacing Biden with Clinton wouldn’t have helped much, the report said. One member of that inner circle, former White House senior adviser David Plouffe, said this is hogwash. And Plouffe took time from his Halloween festivities to tweet about it. “Never any – any – consideration of VP/HRC switch,” Plouffe tweeted. “Not even entertained by the only person who mattered. Or most of us. Back to Halloween.” It is not clear if Obama knew that this may have been planned. And it’s really unclear if Biden knew. Well they do now. Awkward. Should Joe Biden still praise his boss? Brianna Keilar will update us throughout the show Jonathan Martin of the New York Times joins us at 7. And White House Press Secretary Jay Carney will joins us at 8. Federal probe: Kendrick Johnson’s parents are finally getting what they want: Another investigation in their son’s mysterious death. The U.S. Attorney for the middle district of Georgia said he will look at the case. He said he is seeking the truth. That statement must be like music to the Johnson family. They say they’ve been lied to so many times since Johnson was found dead in a Georgia school gym some 10 months ago. They never bought that their son’s death was accidental like a medical examiner said. They believe he was murdered and that someone has tried to cover up evidence. Maybe this new move will get them closer to what they say they really want: the truth. Victor Blackwell will join us throughout the show. And Steve Moore a former FBI agent weighs in at 8. Words with friends: For the many of you who wondered if your laptop or tablet could really cause major havoc on a plane, the FAA will soon answer that question. The FAA will soon let flyers use those devices to watch videos and play games throughout their entire flight. Not just when the plane gets above 10,000 feet. But cell phone users – this new rule will not apply to you. The ban still applies to cell phones. You will still have to keep the cell phone on airplane mode, the FAA says. Alec Baldwin won’t be the only one praising this change. But for some, this change will mean nothing. Just ask travel blogger Jet DiScala. "No one turns their devices off anymore," DiScala says. “These days because all the studies have shown that it doesn't cause any problems, and the pilots are now using stuff (iPads and other electronic devices) in the cockpit." Christine Romans will join us at 6. Survivor: This Texas police officer has a story to tell. And for what she endured, many are calling her a hero. During a recent traffic stop, Ann Carrizales was met with a barrage of bullets. One tore through her face. She then got back in her car and followed the suspect’s car for a seven minute high-speed chase. Much of that amazing ride was captured on her dash cam. “I'm still conscious,” she’s heard saying as the squad car sped down the road. The suspected shooter was caught. Two more suspects are still on the loose. Carrizales is recuperating and says she’s going to spend some down time with her two children. But beware bad guys. She will be back. Pamela Brown joins us throughout the show to give us the latest on this story. More secrets: For the first time in a while, here is some news about Edward Snowden that may not create an international controversy. The man accused of releasing a bevy of sensitive U.S. National Security Agency documents has got a job. And yes it is in Russia, of course. The former U.S. national security contractor turned leaker, starts today at a major Russian website, his lawyer says. Some may question the wisdom of hiring a guy who’s accused of taking and leaking boat loads of secret documents from one of his last employers. But not many know who this new employer is. It’s another secret. For security reasons, Snowden’s lawyer is not naming the website. Diana Magnay joins us to give us more details on this. - Halloween surprise: Yeah, but it was the prankster who gets the surprise. - Bad tooth fairy: – I may be wrong, but I think the tooth fairy is supposed to wait until the tooth comes out. Right? - Ravenous raccoon: The question here is not why this raccoon is eating grapes. Or even who let this crazy raccoon in the house? No, the question is why does this raccoon have better table manners than many of our children? - Wild whale: Speaking of children, these folks should probably move their son a little farther back. This is one bully Beluga. - Crazy finger guy: Now this guy could be the leader of a free styling, finger snapping band. If there was one of those. There’s not? O.K. Be sure to tune in to "New Day" from 6 to 9 a.m. ET. Join us at NewDayCNN.com and go and have a GREAT NEW DAY! Wow...these are some of the most pointless, cutsy fluff pieces that I dont think anyone would call news. Maybe the Kendrick case would qualify, but thats it. FAA rules, Clinton as vice....Come on CNN, Trust me, you dont have to keep dumbing it down to raccoon videos and tooth fairy escapades! We're smart folks! We can deal with hard hitting journalism! The question is, is that still something you can give us? Thank you for your feedback, Andrew. We appreciate all comments. Have a lovely New Day! Awesome. Next stop: Hollywood. Make big $ !! If this guy was WHITE..